Hello world, welcome back to my blog! School has begun and I’ve been busy reading, writing and completing assignments for my classes at Lakehead University (LU). This year is a bit different than last year as I decided to switch my degree midway through the summer. Instead of pursuing environmental management at LU, I switched into forestry! My summer employment at Resolute Forest Products as their Woodlands Operations Intern was what inspired me to switch. As a Fish and Wildlife Technician, diversifying my knowledge and studying forestry will benefit my future employment opportunities in the natural resources sector. For now, I look forward to what the future holds and I’m excited to learn more about forestry. Learning about the Boreal Forest, while spending countless hours in the Boreal Forest, was incredible this summer. My coworkers and I also shared many fun and exciting times. From venturing into the forest to meet up with contractors, reviewing harvest sign-off maps, watching mechanical harvesting operations cut and process wood, completing log quality checks, identifying potential streams in harvest blocks, calculating forest fire codes, flying the drones, walking and flagging road-layout, tree planting, compassing, inspecting aggregate pits, identifying raptors and their nests and observing a ton of flora and fauna on all these adventures were only some of the things that I got to do this summer! Lucky for me, my coworkers always made me feel so welcome and apart of the team. Having the opportunity to work alongside kind, thoughtful, passionate and extremely intelligent people is one of the best feelings in the world, and I loved that each one of them took the time to listen and teach me about the roles that they fulfill at Resolute. 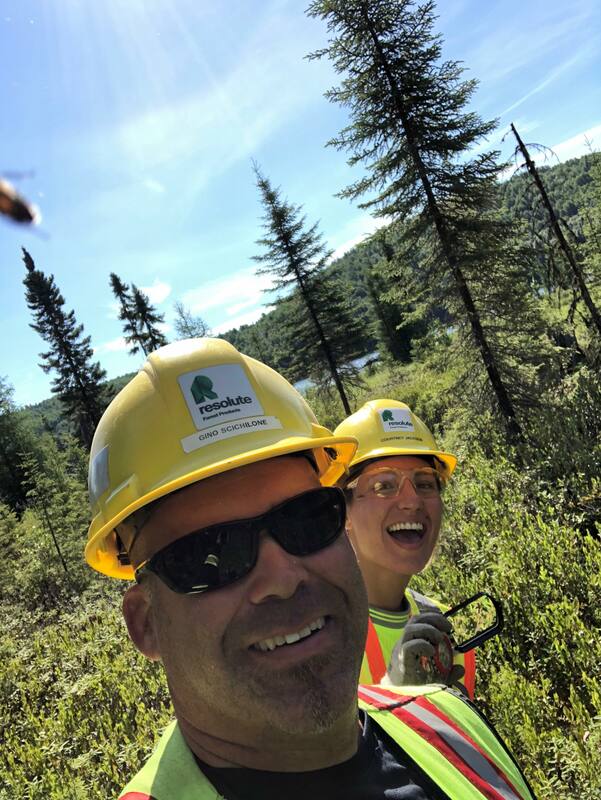 Gino, my coworker and I compassing in the Black Spruce Forest. On my last day at work, two of my coworkers and I went on a tour inside the Resolute paper mill, and we were amazed to watch the process as we toured throughout the mill. From our operations viewpoints, we were all familiar with the harvesting of the trees and the delivery to the mill but, not the paper-making process. It was remarkable! Before this summer, I had never visited a mill, nor did I know about the number of products produced from trees. The forest products industry in Canada is unbelievable, as well as the number of products constructed using timber. Did you know that Resolute is one of the largest producers of newspaper in the world?! 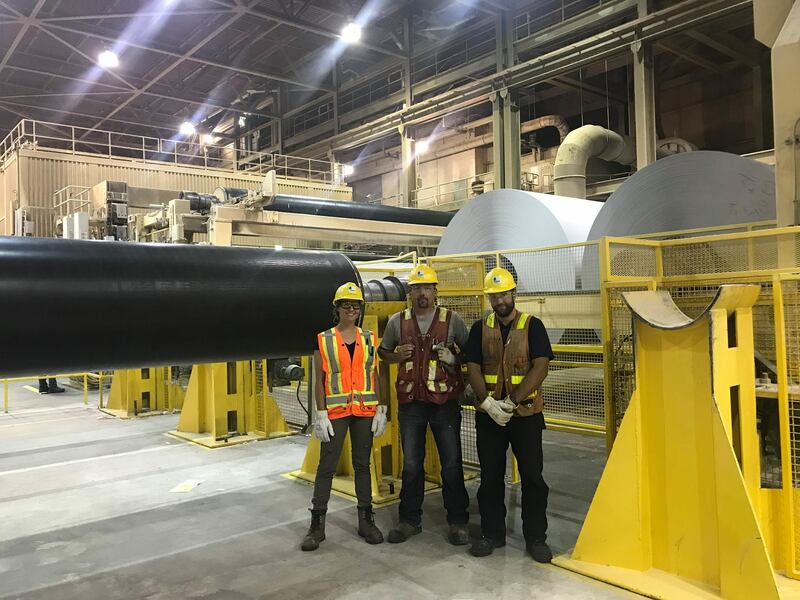 My two coworkers, Craig, Jeff and I standing in front of two gigantic paper rolls in the Resolute paper mill! Another exciting portion to my summer was exploring Thunder Bay. 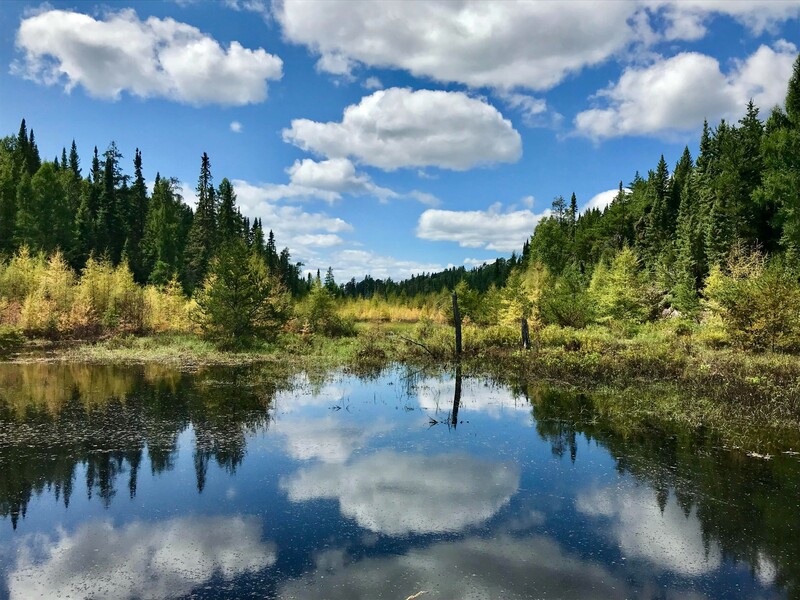 When you travel this far north one day, you should visit Sleeping Giant Provincial Park as it is a must-see! Within the park, there are a bunch of hiking trails that you can walk, run or bike on, and if you’re into camping, there are a ton of locations to pitch a tent! This summer, one of my friends and I went hiking in the park, and we missioned our way to the Top of the Giant! I believe we walked around 20 km there and back and by the end of our hike, we were both exhausted but, the adventure was worth it, and I know that I will do it again next summer! 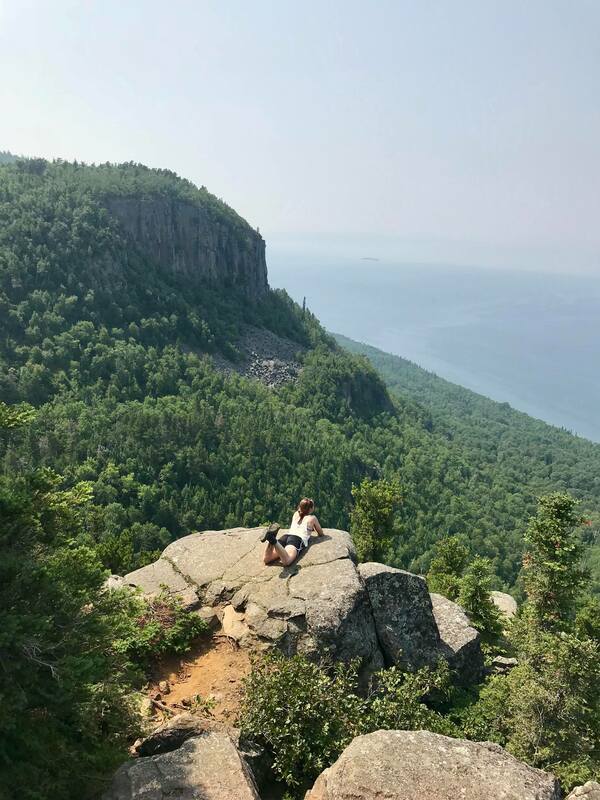 One bonus of hiking in Sleeping Giant Provincial Park is that Lake Superior surrounds you while on most of the trails so if you’re into swimming, take a dip in the water and make a splash in beautiful Lake Superior! I’ll warn you now, the lake is always a bit cold but, you’ll feel refreshed! 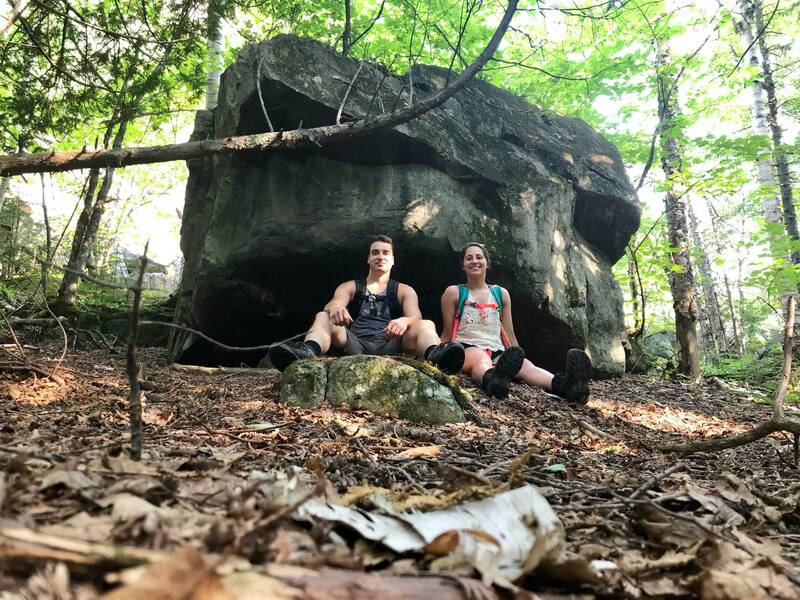 On our way through the park, I couldn’t believe my eyes when I saw this gigantic boulder at the base of a rock face and my friend, Niall and I decided to capture the moment! This is the view that you’ll see when you make it to the Top of the Giant! It was a bit muggy that day, but I promise you that the adventure is worth it! Writing blogs this summer to share my experiences has been a wonderful learning experience for me. Every time that I wrote a blog, I always strived to write an interesting and compelling story. Often, I would do a bit more research to ensure that my entry was informative and enjoyable. In the end, writing about my days at work enhanced my knowledge about the forest products industry and I am glad that I was able to obtain this opportunity, provided by The Greenest Workforce. My summer experiences at Resolute were life-changing; inspiring me in many ways. I know that this experience will benefit me in my studies this year at school, as well as in my future! Already, I miss venturing into the field every week, but I’ll be back in the bush soon enough! Take care everyone, it’s been a pleasure writing for you, and thank you for following my blogs! “Tamarack Glow” captured in the Dog River Matawin Forest.